You’ll have to read Mariam’s Labor Story Part 1 first. See, normal people will have their epidural maybe at 5-6 cm dilation. Your Proudduck here on the other hand… not such a proud duck when it comes to pain. 1 cm and am already cursing the walls and floors and doors and windows for merely existing. “Hold on, let me get you a wheelchair, Madam,” the polite nurse says to me after I’ve begged her for epidural for the fifth time. In the labour room, there was another lady about to give birth. I had to pass her room to get to mine. Her door was open and I immediately saw her gorgeous LV bag on the counter. Oooohh, I thought to myself, nice colour. For that 5 seconds, I forgot about contractions. “9 cm dilated and just gas? Oohhh poor girl,” I sympathized while sipping the straw of my Yeo’s Lychee drink. Ahhh, nice and cold. That wasn’t me, guys. That was the poor lady next door. There she goes again, my poor poor too-late-for-epidural-9-cm-dilated-now-maybe-9.5cm-dilated neighbor. She’s right behind this wall, guys! In soooo much pain. I could feel her pain omg. Her screams were really making my contractions stronger, I swear. I hugged Dean even tighter. “I can’t listen to her give birth. I’m so scared. Please we have to change rooms,” I begged him. We managed to move to 2 rooms away from the poor lady about to give birth. I made doa for her, guys. Listening to her in so much pain… like wow, any woman would want to cross her legs shut. God bless her. And God bless whoever invented epidural. The nurses brought some bread and jam for me to eat. Same menu as Daniel’s labor too. I smiled as I spread the raspberry jam on the slice of bread. There was the baby bed next to me. I smiled at my huge belly thinking in just a bit, my little daughter is going to be born. I had butterflies in my tummy with excitement, I can’t wait to meet this little angel. She’s going to be put right there in just a few hours. Faintly, but surely…. “OMG IS THAT HER?! We can still hear her from here? !” I told Dean and ran to the toilet. “I’m just going to stay in here until the epidural doctor comes.” I told him as I sat on the toilet bowl covering my ears through her screams. Great. Lucky chick. She’s done and I’m still here with my 1cm cervix, hugging walls and all. Can barely type properly anymore. Epidural doctor finally came! I almost flung my hospital robe away so that he can stick the needle in my back quickly. He could tell I was in a lot of pain so there was no time for the how-are-you-oohhh-nice-weather-outside chit chat. He did the epidural on me while I hugged Dean and instantly I felt a burden being lifted. I couldn’t feel the contraction pains anymore and I could finally sit smiling. I don’t know why people are so scared of the epidural, it really is just like getting a normal jab on your arm. I would really highly recommend just two things in life; shopping at FashionValet…. and taking the epidural. Because of the epidural, I also had to have the IV drip (which seriously hurts more! I hate that thing). Since I couldn’t walk anymore since I had tubes attached to me, I just rested on the bed with Dean by my side. He read the Quran and I too attempted to do so. But a few minutes later, I started to feel a bit funny…. Something was a bit off…..
Till the next and final part! I’m too sleepy to continue, plus it’s Monday workday tomorrow. Will finish the labour story soon! In the meantime, remember to take epidural. yeahhhh i do love epidural..
Quickly finish the last part! I am going into labour anytime soonnnn~! i had the happydural and went through czer! sy masuk labor room around 8:15 am with 4cm dilation.. screaming for epidural too tapi malangnya pakar bius start duty at 9 am..
9:15 am sy minta epidural lg, nurse check dah 9cm dilation.. so bye bye to epidural..huhu..
V, your neighbour tu reminds me of my labour too. I had a lady next to my room who screamed bloody murder. The nurses told me she refused any sort of pain relief and wanted the au naturale way! Gosh! Anyway, CC to answer your question based on my experience, I requested the lowest dosage so that I could feel the contrax and know when to push. Sakit masih terasa but still bearable though. Discuss with your gynae during your appointments (not during labour!) on the pain relief options and dosage ok? Good luck mommy! the screaming neighbour is soooo TRUE! i once experienced the same but i heard 2-3 screams at once can you imagine? i remember i feel pissed at them and act the way you do covering my ears and all. didnt they know the more you scream the more you will waste your energy to push? God bless them anyways. luckily husband keep on reminding me not to scream. Owh Vivy, I really enjoy your labour story from your point of view. Hehehehe.Chuckle. You are so cute especially when you felt sorry for that lady. I was once that lady, who was so convinced to get epidural but it was too late. I arrived and it was 5 cm. Pain hurts like hell. I twisted and turned and bargain with Almighty Allah, why was he making all mothers suffer with this pain? And owh it was to erase our sin, thats why. Okay. But this hurts too much. Me:Sure!! I still have time! !Just call aneast to help another dr in distress..
And the nice doc broke my waterbag..
All hell broke loose. Pain was even worse than b4 as if it was possible.. I vomitted next to my bed. Suddenly from 5cm it went to 9 cm. 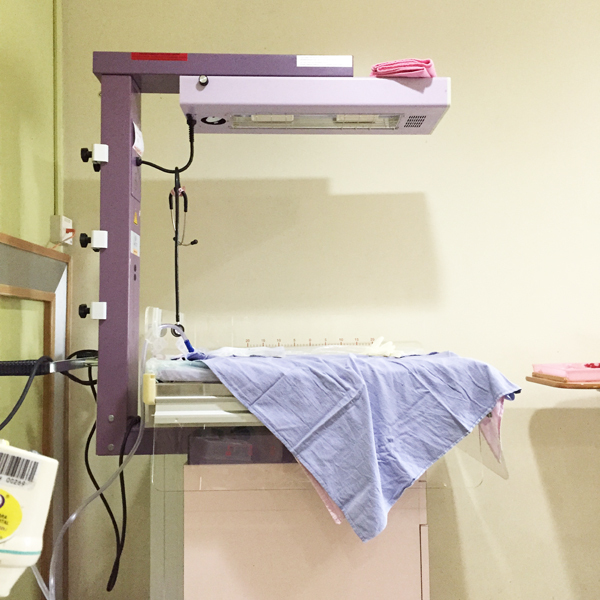 They rushed me to labour room immediately and I wanted to push my baby right in the lift on the stretcher. Nurse:Cross your legs close. Dun push. Me:Owh God!! Its coming again!! Forgot about happydural and I was stressed about giving birth at the hallway. Reached labour room and plop baby came. Damn quick labor with an unforgettable pain. Vivy, i’ve read somewhere that epidural could disturb the early milk production due to the epidural restricting the oxytoxin hormone. Is this true? i don’t get to experience the epidural since i came to the hospital at 7cm dilated. i did asked for it but my gynae said i don’t have to disturb the ‘doktor bius’ lah. u can do this, so strong already at 7cm. -.-” hehe….. The massage in the last sentence is/was very clear.. haha.. you can be an epidural spoke person..
Can you share Mariam’s cukur jambul event also ? Pleaseeeee. ahhhhh… choo!!! trust dean to enlighten any situation huh.. hahahaha.. so funny!!! I always wonder how to know when is the time to push when epidural take the pain away?? 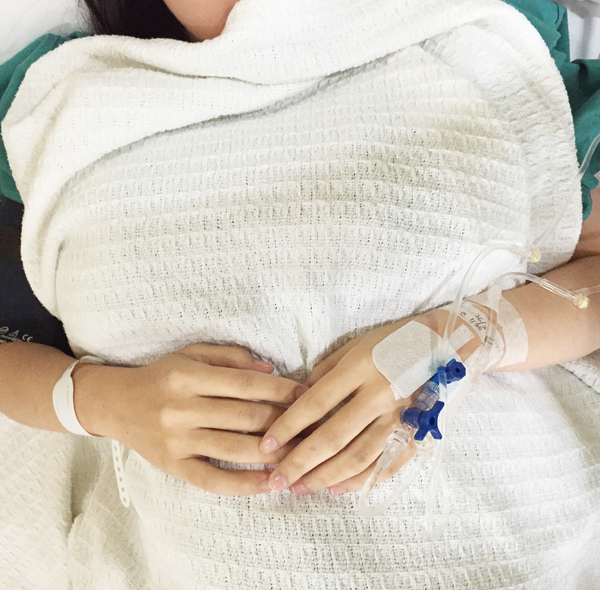 All my 3 dotter went tru normal labor and the contraction was ohmygoddddddddddd….bcoz of this bad bad bad contraction i shut down kilang oredi. 3 dotter no boy xpe tqvm. I was also induced and have already asked for epi prior to being induced. (Very chicken of me..I know..but being induced is waaaaaay painful and takes a longer time than having a spontaneous labor). I was in the labor room for 24 hours and had 12 hours of labor. When I was 9cm dilated, they turned off the epidural, so to those wondering, yes, you can feel and know when to push. I only found out they turned it off after giving birth. Midwives said they purposely don’t tell you because you may panic or something. Mad respect to those who choose not to take any pain relief, but I’m still glad I took it because it helped me conserve energy for the push. Two months after giving birth and alhamdulillah no side effects. yup! bless whoever invented epidural.. my no 1,2 and 3 no epidural but no 4 and 5 yes epidural! I am one-happy-in-labor-mummy for no 4 and 5. I was so relaxed. I can wirid, doa, and read quran while waiting. Alhamdulillah for that! gosh vivy. you should join hypnobirthing class next time! Alhamdullillah i managed to deliver my baby boy 8 hours after I requested for epidural; without epidural – (lol tongue twister). try next time (if you have the patience for 6 weeks of classes – 3 hours each). haha, your story really makes me want to pregnant again. my 1st pregnant was soooo extreme. giving birth at 25 weeks with baby weight only 835 gram and yes its normal. and now, I keep wondering how it feels to get pregnant until 9 months. and after read your story I really really interested with epidural. hahaha. hope ada rezeki for the second baby. can’t wait for the ending of labour story! what people dont understand is how we all feel pain differently. some people only feel intense pain when dah 6-7cm bukak. some 1cm (like us) dah macam nak mati (seriously! some people kene pinch pun boleh menangis!) i tried to tahan till 3cm then my face dah mcm hantu the doctor said better take la takut u pitam nnti. i was shaking like mad weyh. thank you Allah for giving the idea to the doctors who invented epidural! cant wait for the 3rd post! U should consider hypnobirth hehe.. Cost of epidural is 1k and above while hypnobirth cost less than 1k and proven its efficiency. Eagerly waiting with a super high level of patience. 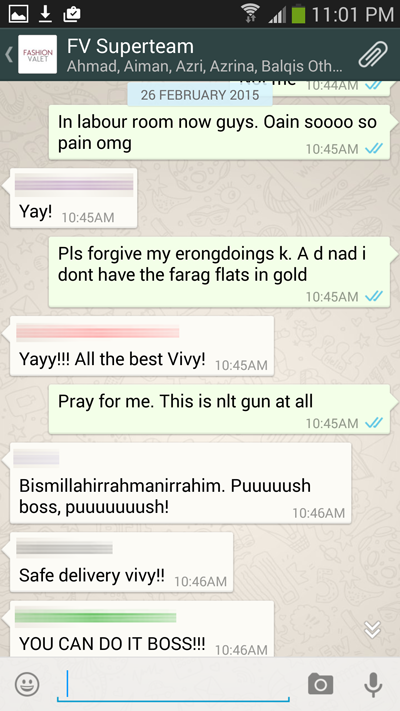 Vivy, pls pls consider to go hypnobirthing or amani class for ur 3rd child. If no time to join, learn about it from reading. Go join The Gentle Birthing Group Malaysia in FB. Banyak ilmu boleh dpt. I delivered my 2nd child by myself at our home. Well, im about going to hospital to water birth my baby but Allah had His plan. Water birth jugak, but at our sweet home. Go for water birth vivy…! Best! had epi 1st time during labour of my 1st baby 12 yrs ago. Amazing stress free birth. No pain at all but can still feel the pressure when its time to push. 2nd baby requested for epi at 3cm. Got it 15 min later at 6cm. My baby was born 15 min later. Effect of epi came right after baby came out (worst back pain labour ever). 3rd baby again requested for epi. All was well. No pain but the most unbelievable and uncomfortable numbness to my left below the waist. Was still feeling dizzy 1 day after labour. My 4th last year again requested for epi. The pain was unbelievable as my contraction came every 1 min for a painful 1 minute long. I was dilated at 3cm then. I was shivering in pain. The gas was useless at this point. When dr came to cucuk the epi, he cant do it coz i can stop shivering. He had to administer spinal injection before he can give me my epi (googled “spinal injection” to know what the hell i consented to after delivery). Ironic, isn’t it? But yes, I HATE THAT IV AS WELL! Sakit like, what theeee.